Edit: 12/3/2012 - Complete Reboot! Many of the pieces from ghostfire.net or specifically at the ghostfire market. I had no idea you drew these but I have a poster in my room! Wasn’t this design on a tee shirt? DA PIGMAN'S!!! I LOVE IT! 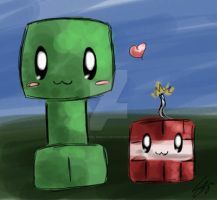 awww the enderman so cute! I got this poster! IT'S AMAZING!! i saw these on a shirt. i want it sooo bad! I just saw all of these and the others on a poster in 5below. It got me nervous because I knew it was your art and it made me wonder if you knew that Jinx/Mojang/Trends had put them on posters and all that other artsy leagel things. Same here, its hanging in my living room. Hello my name is Peet Cooper. I’m a game developer and a fan of your work. SO AWESOME!!! We are putting together a charity Artbook for a friend who is suffering with a rare form of cancer. We would love if you might be willing contribute this image for us to use. You can create something new if you prefer. Message me if you are interested. 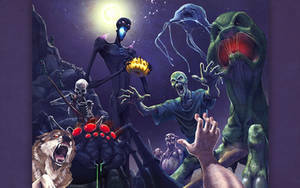 ahhh port ghast XD nice work man !!!!! 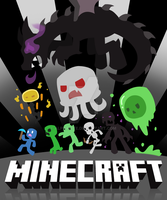 there should be a texture pack like this! OH MY FREAKIN' GAUD I'TS SO ADORALBLE EVEN THOUGH THEY GONNA KILL MEH!